Ireland scrumhalf John Cooney was back in Belfast on Monday training with his Ulster team mates. Cooney came off the bench in both of Ireland’s opening games in the Six Nations Championship. However, he only got a total of seven minutes which led to some criticism of Irish head coach Joe Schmidt given that starting scrumhalf Conor Murray was performing somewhat below par in both the loss to England and the win over Scotland. 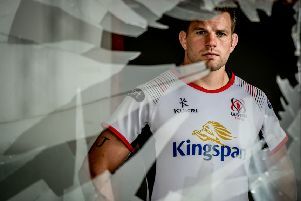 However, Ulster will be glad to have one of their key performers this season back in action as they go into Friday night’s game at Bridgend against Ospreys. It marks an important mini block of fixtures in the Guinness PRO14 for Ulster as they bid to secure qualification for next season’s European Champions Cup. Ulster currently lie fifth in Conference B - two places outside the automatic European qualification - but there are only two points between them and Benetton who are in second place. With a home game against Zebre to come after Ospryes and then a trip to Dragons, Ulster will be keen to make their mark before the next break. While Cooney has been released by Ireland, centre Will Addison has not, even though he has seen no game time over the past fortnight and there is also a question-mark over fellow Irish team squad member Jordi Murphy.